Starwood Hotels has reached milestones with three of its nine hotel brands through new hotel openings in 2013. Aloft Hotels, the cookie-cutter colorful vision of W Hotels, has reached 75 properties. St. Regis, the luxury segment brand, has reached 31 hotels worldwide. Element, Starwood’s extended stay brand, has opened its first property outside the USA in suburban Toronto. Before the financial recession of 2008 there were reports coming out of Starwood Hotels that Aloft would have 500 properties by this time. That did not work out. Yet, Aloft has seen major growth over the past five years. Aloft Panama is the 75th hotel in the Aloft brand and the fourth Aloft hotel in Latin America. Aloft Panama is a category 3 hotel at 7,000 points. Aloft has hotels in 14 countries currently and the brand is expected to open hotels in 10 more countries by 2016. In the past six months alone, the Aloft brand has opened hotels in Miami, Chicago, Cleveland, Tulsa, Cancun, Bursa, Kuala Lumpur and Ahmedabad. Plans are for 17 more hotels to open in 2013 and another 19 hotels in 2014. Starwood Hotels describes the Aloft brand as designed for the next generation traveler. I view Aloft as a poor man’s version of W colors. The primary problem is the hotel room size at Aloft favors the single traveler. These rooms are cramped. My last stay at the Aloft Broomfield, Colorado was a hotel that offered suites, however, I did not see one and the room where I stayed looked like all the other Aloft rooms. Bright colors. My hotel review is Simple Chic @Aloft Broomfield-Denver, Colorado. Pool table in the lobby is a cool feature of the Aloft Brand. Element expands to an international presence with Element Vaughan Southwest, a 152-room hotel in Vaughan, Ontario, just outside Toronto. The hotel is SPG category 3 at 7,000 points per night. Its opening marks the beginning of a global expansion that will see the Element brand add to its global portfolio and enter key European and Asian markets over the next few years. These include new Element hotels in Vancouver and Frankfurt, slated to open in 2014; Suzhou, China in 2015; and Calgary in 2016. Element extended stay hotels offer apartment style rooms with a kitchen. These are also cookie-cutter designed hotels, yet Element as a brand strives for environmentally friendly design. Element made history in 2008 as the only major hotel brand to pursue LEED certification for high-performance buildings brand-wide. To date, there are Element hotels in 11 North American markets, with new domestic and international hotels in development. Visit www.ElementHotels.com. Element Vaughan Southwest, Toronto, Ontario area. St. Regis brand reaches 31 hotels with St. Regis Abu Dhabi. The St. Regis hotel brand has doubled in the past five years since the global recession. 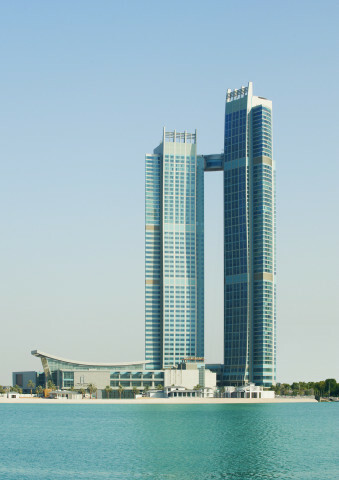 The St. Regis Abu Dhabi boasts the world’s highest suspended hotel suite, set between two towers. The extravagant Abu Dhabi Suite is positioned a lofty 650 feet above ground between the two towers and offering magnificent panoramic views of the Arabian Gulf, the Corniche and the city skyline. Spanning over 11,600 square feet, the suite combines contemporary design with a traditional Arabic influence. The opulent suite features cascading strands of crystals, 24-carat gold leaf accents, leather wall tiles, jewel-toned velvet upholstered walls and intricate glass mosaic patterns. The Abu Dhabi Suite features three bedrooms, a grand majlis with a soaring ceiling, luxurious spa and movie theatre as well as a kitchen, dining room, fully-equipped gym and private elevator access. St. Regis Abu Dhabi is a category 5 hotel at 12,000 points or 16,000 points per night. Room rates for a standard room are $319 to $368 for standard rooms for dates checked in October. My stays at Element have been underwhelming. The Element branding is way too cool to allow drain cleaners so clogged drains remain clogged till you check out (I guess once you check out they use the drano). Quite honestly, I have found ResINN rooms work better for me, ditto for Homewood. Element hotel stays have been fine for me. With both Alfot and Element Starwood has outdone Marriott in the generic hotels realm. For the Element brand I wish they would also offer one bedroom suites like Homewood Suites and Residence Inn offer as I feel it better for family travel. As for the Aloft brand, the whole thing is more like a dumpster fire. The layout and the spacing in the room is useless. I am also not a big fan of their bathroom design. But the worst aspect has been the terrible customer service I received at three different hotels with multiple visits to each hotel. Examples include checkin being slow or trying to find a person who could check me in or out, able to answer questions, or charge a snack to the room. Re:Fuel was another disappointment, the concept is really nice but the execution is really horrible. Waiting five minutes before somebody show up to an order for breakfast sandwich, not being able to charge the said item to room number when ordering instead having to do it with front desk person (who are busy helping others in the morning quite often). So a simple task of ordering a breakfast sandwich to go took over 15 minutes, when it should take no more the five minutes (with need to cook said sandwich). At this point going through McDonald’s drive way would have been more prudent. Compare this to Hilton Garden Inn or Courtyard where customer service is much better, including being able to find front desk person to charge snacks to the room or be able to answer questions and provided assistance. It is sad that Starwood who have good hotels and delivered good customer service at other brands I have stayed (Westin, Sheraton, Four Points and TLC ) can’t match the same level of service and good hotels at their budget brands. Unless the price is much cheaper than Independent Hotels, Marriott and Hilton I plan to stay clear of these two brands. Somebody soon I hope to experience St. Regis but right now I don’t have currency ($ or points) to stay at their hotels. @stuckintraffic – I agree with your assessment of Aloft. When I see $189 rates for Aloft I look elsewhere. If the rates stayed under $99 the brand concept would work for me. Element does have one bedroom and two bedroom suites. I have only stayed in the studio so I have no pictures of suites. St. Regis Hotels are nice for the rooms and the facilities, but I find them too pretentious for me. I generally do not feel comfortable hanging out at St. Regis hotels. There are always too many staff bugging me around every corner with a greeting and conversation starter.